Impress your guests with this simple-to-make roulade. The cherries are from our Christmas range of fruits in alcohol, a perfect treat at this time of year. Preheat the oven to 180°C, gas mark 4. Grease and line a Swiss roll tin measuring approx 32.5cm x 23cm with baking parchment. Make a small diagonal snip in each of the corners to give a snug fit. Melt 100g of the chocolate in a heatproof bowl over a pan of barely simmering water. Place the egg yolks and sugar in a large bowl. Whisk until pale and creamy. Stir in the chocolate and sifted flour. Using a clean whisk, beat the egg whites in a clean, dry bowl, until stiff peaks form. Using a metal spoon, carefully and gradually fold the whites into the chocolate mixture, until well combined. Tip into the prepared tin and shake to level it. Place in the oven for 15-20 minutes, until the sponge is slightly risen and just firm to the touch. Drain the cherries in a sieve over a bowl. Whip the cream until just starting to thicken, then fold in the cherries. Unroll the roulade, discard the paper and spread the cherry-cream carefully over the surface, leaving a 2cm gap all the way around the edge. Re-roll the roulade (don't worry if it cracks a little). 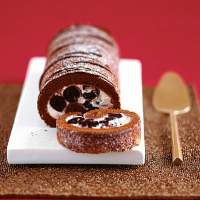 To decorate, melt the remaining chocolate , then drizzle over the roulade. Lightly dust with icing sugar and serve immediately. Use the remaining kirsch from the cherries to make a cocktail by mixing it with lemonade or soda. A tangy Madeira such as Blandy's Duke of Clarence Rich Madeira will be wonderful with the roulade.